Fresh, tangy, and just a little spicy! I made this fresh green salsa for a little catering gig that I had this week. Yes, you heard me… A CATERING GIG! I made some Latin-ish (I know, not a real word) appetizers for a fabulous group of ladies at a beautiful home in Laguna Beach. This yummy salsa or “relish” as I like to call it, made an appearance on a little corn cake appetizer that I made for the party. Stay tuned for the corn cake recipe…they were delicious! 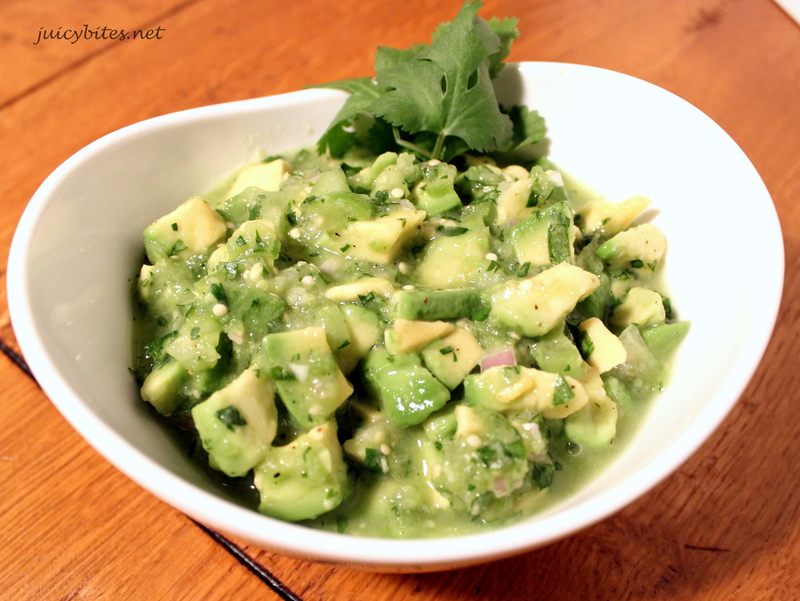 The combo of the bright and tangy flavor of the tomatillos combined with the creamy smooth avocado is a winner! There is just a smidgen of honey that balances out the acidity of the lime and tomatillo. You could use this in so many ways. It would be delicious on fish or chicken, in a carnitas taco, or just served with chips (that could be dinner for me :)). Even my non salsa eating 6 year old loved this because he likes avocados so much. I cook with tomatillos a lot, but I have never actually used them without cooking them first. Their flavor is brighter and bolder when they are raw. I love it…and you will too! The next time you are serving any sort of Mexican food, this Tomatillo and Avocado Relish MUST make an appearance! 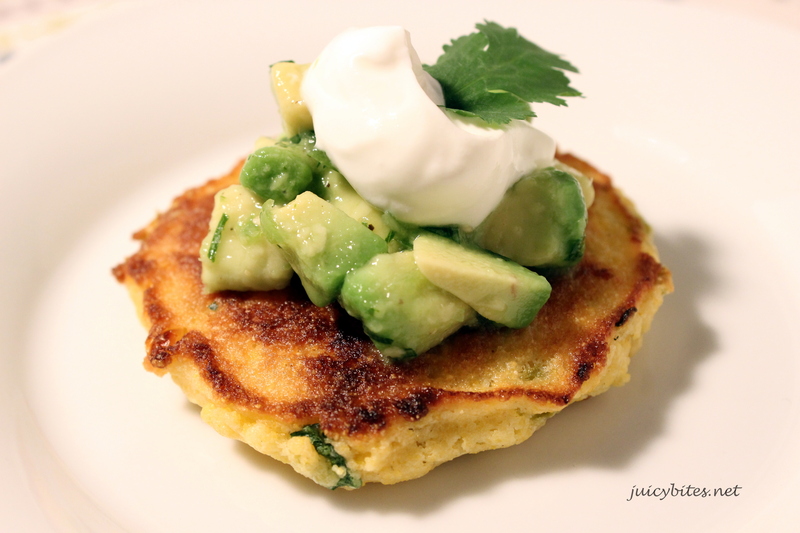 As I said earlier, I used it on these yummy little corn cakes. They were great like this as an appetizer, but even better when I served them topped with black beans and the relish for dinner the other night. Don’t worry…I will share it with you soon! 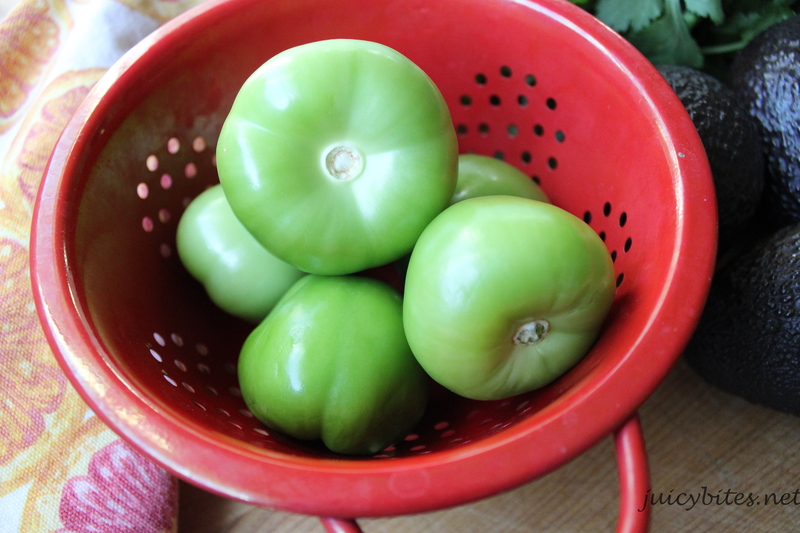 If you haven’t used tomatillos before, don’t let them scare you. You will find them in the produce section and they are covered with little green paper-ish husks. When you are ready to use them, remove the husks and wash them well. They have a sort of sticky film on them that rinses off. As for the heat in this, I used jalapenos. I went with one because I didn’t want too much heat. You could use 2 or use a serrano if you want a spicier relish. Dice half of your tomatillos and put in a bowl. 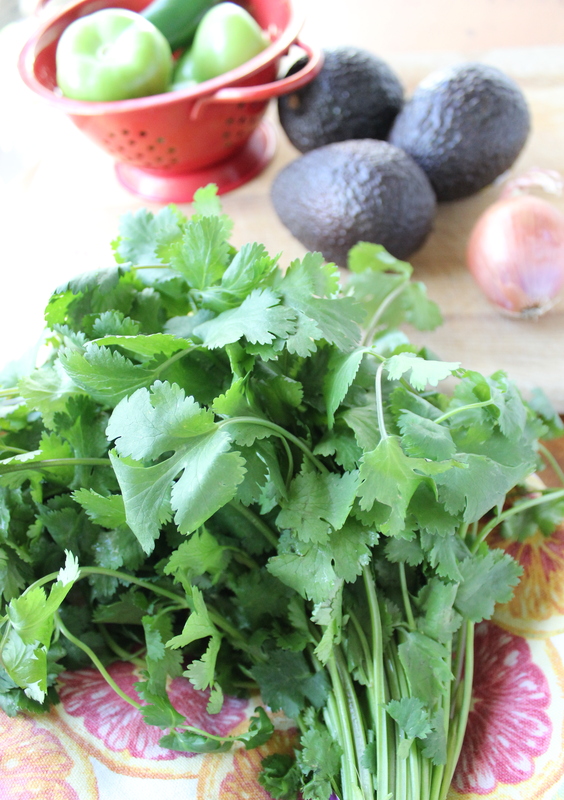 Add the diced avocado, the jalapenos, the garlic, the shallot, the green onions, and the cilantro. Cut the rest of your tomatillos in quarters and put in a small food processor or blender. Add the lime juice and honey and pulse a few times until the tomatillos are chopped small. Don’t over puree, you want to keep a little texture. Add the mix in with the diced tomatillos and the avocado along with some salt (start with 1/2 teaspoon) and pepper and gently mix well. Taste for seasoning. This will keep in an air tight container for about 2 days. Do you have a recipe you like for the corn cakes? Looks delicious! Can’t wait to try. I will be posting the corn cake recipe today or tomorrow. They were really good! Thanks Melanie!